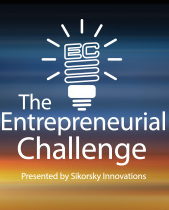 8th Sikorsky Entrepreneurial Challenge — application period is closed. We are very pleased with the interest in the 8th EChallenge. Thanks to our many applicants. We are now selecting finalists and will announce the top firms in late September or early October. IoT for Aerospace and Defense — the Sikorsky Entrepreneurial Challenge Webinar is June 14 at noon. Want your tech to meet the needs of the world’s toughest customers? Then join us for this webinar on June 14 as top Sikorsky and Lockheed Martin technical leaders take you through their needs for robust IoT Sensor communication, On-Sensor processing (Sensor Fusion), and Next Generation Wireless Communication. As soon as possible, we will post a video recording of the 6/14 webinar. For the 8th competition, Sikorsky Innovations, along with its competition partner the Stamford Innovation Center, is continuing its tradition of unveiling a new set of focus areas: (1) Distributed, Reconfigurable MEMS Sensor Network; (2) Adaptive Communications for Assured Data Exchange; and, (3) Advanced Sensor Fusion. These areas highlight current technologies the company believes represent disruptive opportunities for the aerospace market for which near-term opportunities exist for collaboration with Sikorsky and other Lockheed Martin Rotary and Mission Systems organizations. BETHESDA, Md., Feb. 20, 2017 — Lockheed Martin Ventures, the venture capital arm of Lockheed Martin, in partnership with ClearSky and ARCH Venture Partners, is accepting applications for a first-of-its-kind competition that will have entrepreneurs pitch their business plan in a helicopter in the skies above Austin, Texas. The pitch, at the 2017 South by Southwest festival, is part of Lockheed Martin’s increased focus on investing in emerging companies. Read More here. TechAloft — Now a Bi-Monthly Newsletter. Looking for a quick update on what’s new in tech and manufacturing? TechAloft is a good way to start. Here’s a few stories from our first edition. TechAloft is focused on telling the story of how advances in aerospace and defense industries can produce technology and results that help us all. TechAloft is produced by the Stamford Innovation Center. Congratulations to Liquid Piston, the winner of the 7th Sikorsky Entrepreneurial Challenge for their work in advanced Propulsion. Based in Bloomfield, CT, LiquidPiston specializes in development of compact, powerful, quiet, efficient, low-vibration, scalable, multi-fuel capable rotary combustion engines, based on its patented High Efficiency Hybrid Thermodynamic Cycle. LiquidPiston received a $25,000 cash prize along with an opportunity to explore opportunities for LiquidPiston’s technology with the Sikorsky product line. The submission deadline for the 7th Sikorsky Challenge has passed. But if you would like to know what Sikorsky’s top engineers are interested in, please watch our webinar. The Entrepreneurial Challenge is open to any company, U.S. based or international, including newly-formed and pre-revenue entities, that meet the requirements defined in the Entrepreneurial Challenge Application Kit. Learn more in our Simple Submission Guidelines. 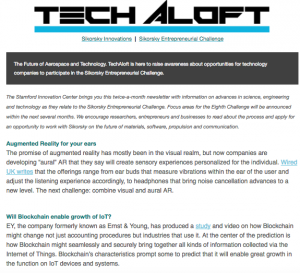 Visit the TechAloft blog for updates on our challenge and informative articles about new tech in aerospace. Sikorsky and Lockheed are looking for the companies who are pushing the boundaries of tech. If you'd like to hear about our startup challenges and the latest news about aerospace tech, please subscribe here. The Entrepreneurial Challenge is open to any company, U.S. based or international, including newly-formed and pre-revenue entities, that meet the requirements defined in the 2016 Entrepreneurial Challenge Application Kit. Find out what other companies have participated in the Sikorsky Entrepreneurial Challenge. Copyright © 2017 Stamford Innovation Center. Site built to promote Sikorsky Entrepreneurial Challenge.